Heat oven to 375°F. Spray 12 regular-size muffins cups with cooking spray. Make potatoes as directed on box, omitting margarine. When done, place in large bowl. Using same skillet, cook onion over medium heat until soft, stirring occasionally. Add onion, green chiles and cheese to potatoes in bowl. Stir in beaten eggs. Divide mixture evenly among muffin cups, about 1/3 cup each. Press down into cups. Bake 25 to 30 minutes or until tops are golden brown and crispy. Cool 5 minutes. Serve with avocado, sour cream and cilantro. 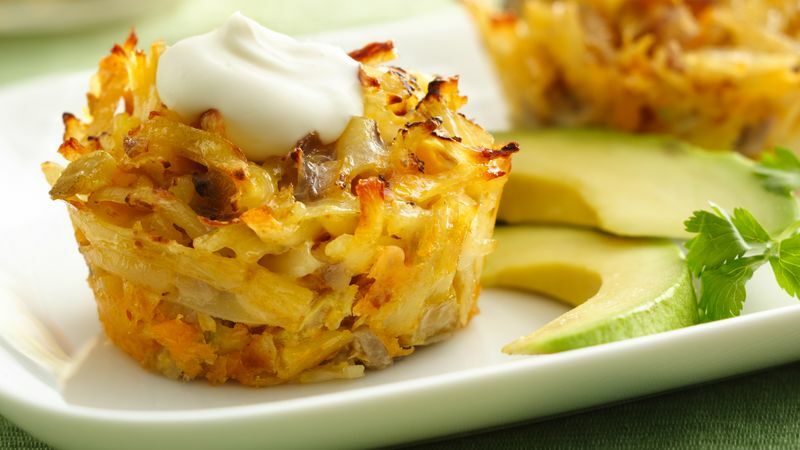 Substitute your favorite veggies in this savory cupcake; just be sure to cook them first in a skillet, and mix in with the potato mixture.